As a peaceful crowd of upwards of a thousand people quietly demonstrates outside the hospital where he is a patient, there has been a flurry of activity in the last 24 hours in the case of Alfie Evans, whose ventilator had been ordered disconnected by Mr. Justice Hayden, the trial judge. Most importantly, as of Wednesday, it appeared as if the ventilator assisting the 23-month-old gravely ill toddler was about to be imminently disconnected, although Judge Hayden had ordered the date kept secret. Now there will be another meeting this coming Monday in the Court of Appeal. But, as hundreds gathered outside Alder Hey children’s hospital to protest the decision, the judge overseeing the case [Hayden] is understood to have issued an emergency order paving the way for a further hearing on Monday at the Court of Appeal. The campaign for Alfie’s care to continue, led by his parents Tom Evans and Kate James, was dealt a devastating blow at the High Court last week when Mr. Justice Hayden specified a date for when the 23-month-old’s medical support could be withdrawn. But on Thursday night the emergency order, written as up to one thousand backers of the campaign group Alfie’s Army gathered outside Alder Hey, appeared to supersede that decision pending further legal arguments. 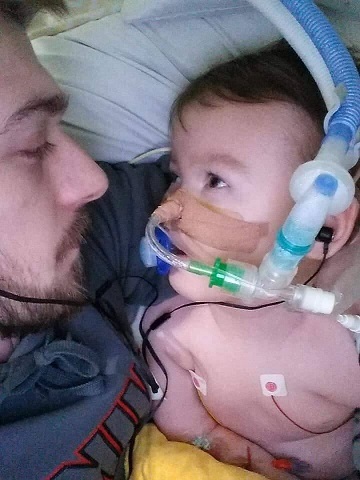 Needless to say that is not the hospital’s position nor, as yet, of any of the courts in which the parents have challenged the original decision authorizing Alder Hey to disconnect Alfie’s ventilator. Alfie, who was born May 9, 2016, has a terribly degenerative brain disorder that has baffled physicians and specialists. Alfie has been a patient at the hospital since December 2016. Tom and Kate lost at all three levels of the British judiciary— the trial court, the Court of Appeal, and the Supreme Court. All backed the hospital’s conclusion. Their last ditch appeal to the European Court of Human Rights was rebuffed. Last week Tom and Kate thought they had reached an agreement with Alder Hey to suspend the end-of-life protocol “so they can review Alfie’s situation and see if he is fit to travel abroad for further medical treatment,” as Sarah Evans, Alfie’s aunt, told reporters. “It is seven weeks since I declared Alfie’s situation to be contrary to his best interests. “The parents and in particular Mr. Evans has not in truth engaged with the care plan. Since then, the size of the peaceful protests continues to grow and, as noted above, the parents will make their case to the Court of Appeal on Monday. As NRL News Today was about to post this story, there was another message posted on the Facebook of Alfie’s Army. It was from Wajid Khan, a member of the European Parliament from Great Britain. previously promised to raise awareness at the EU [European Union] parliament through requesting a speech at a plenary session. I am glad to say that the speech has been accepted for the next plenary session in Strausborg on Monday 16th April 2018 around 9-10 pm. The speech can be tuned in live from the EU Parliament website when the link is active online. I wanted to ask yourself and Kate, if it was okay for me to display Alfie’s picture on my desk at the plenary session so everyone can see what a beautiful young boy and strong fighter Alfie is.